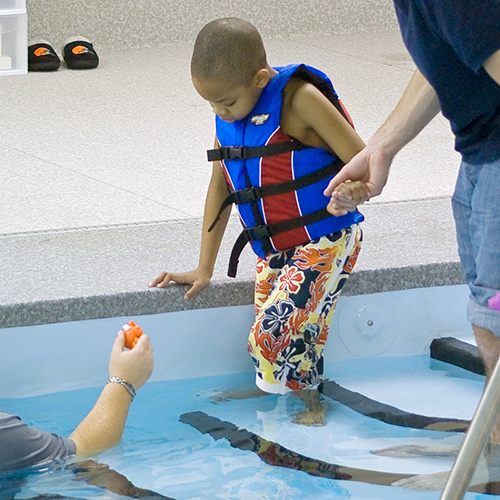 The Bellefaire JCB Aquatics Facility offers private therapeutic adaptive swimming lessons for children and young adults with Autism Spectrum Disorder, developmental disabilities, or emotional and behavioral disorders. The facility and programming were developed to meet a variety of sensory challenges including visual, auditory, physical and movement. The one-on-one instruction is provided by staff who are specially trained by the program director in adaptive aquatics. Lessons can be 30 or 60 minutes and are scheduled to fit your needs. Sibling play swim is also available. Fees may be eligible for payment/reimbursement by Board of Developmental Disabilities.